Click here to view the video with Ron Guidry and Kevin Foote. Ron Guidry talks about his baseball career, his relationship with Yogi Berra and why George Steinbrenner was such a huge fan of his rabbit stew. Reading Ron Guidry’s newly released autobiography, "Gator: My Life in Pinstripes," this week was a strange experience for me. As a young Major League Baseball fan in the 1970s, I was a rarity in these parts. I didn’t root for the New York Yankees. My favorite team was always the Houston Astros, but I rooted for one team in each of the four divisions as a youngster to make it fun. In the American League, I chose the Kansas City Royals in the West and the Boston Red Sox in the East. New UL Hall of Famer Ron Guidry remembers friendship with Yogi Berra. In the 1970s, those were the two biggest rivals of the Yankees. For most older fans, rooting for the Yankees was about guys like Mickey Mantle and Yogi Berra. For many in South Louisiana in the 1970s, though, it was about Lafayette’s own Ron Guidry. In Mrs. Collins’ seventh-grade English class at Judice Elementary, she held a competition for the 1978 World Series. Everybody rooting for the Yankees decorated one side of the room and everybody rooting for the Dodgers decorated the other side. Whichever side was judged to be the best presentation won the competition and received whatever the prize was. I don’t really remember the class size, but let’s just say it was 28 versus 2. Yes, a girl named Angelle Burke and I were the only two decorating in Dodger Blue. 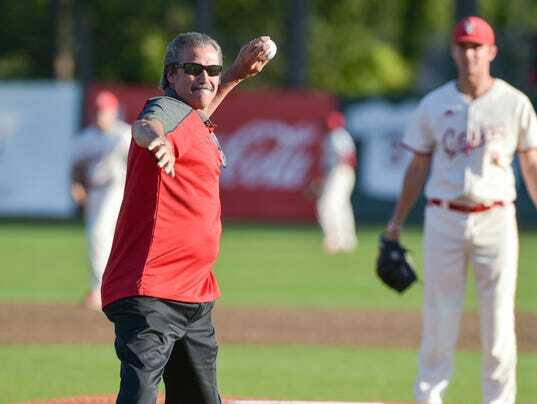 Ron Guidry will be the only inductee Saturday in the UL Hall of Fame. I was no Dodger fan, but I certainly didn’t root for the Yankees — Guidry or no Guidry. After all, I had just endured the heartache of Boston’s division playoff loss to the Yankees, who then promptly beat Kansas City in the ALCS. But as I read Guidry’s book, all of those memories — sad as they were at the time due to the Yankees’ dominance — came back to me with great detail. At 2 p.m. Saturday at Barnes and Noble bookstore near the Acadiana Mall, Guidry will be on hand doing a book signing for this new autobiography. I’m no expert book reviewer. I didn’t read it to judge his story-telling skills or his sentence structure, like Mrs. Collins probably would have. I read it as a baseball fan. Sure, one that still roots against the Yankees and — incidentally no longer cares about the Red Sox now that they’ve become too much like the Yankees. But at some level, great baseball stories and great baseball insight erase team loyalty lines. To read about the behind-the-scenes details of that infamous 1978 playoff game through the eyes of New York’s starting pitcher that day was fascinating — even for someone who wanted Yaz and not Reggie to win that day. Love them or hate them, there was no denying that George Steinbrenner and his Yankees were largely the center of the MLB universe during much of my life as a fan. Gaining a better appreciation for The Boss through Guidry’s words was unexpected. Learning more about the former teammates that had the greatest impact on Guidry’s Cy Young career was interesting — even for a Yankee hater. Yankee fan or not, it’s still cool to have one of our own play such a critical role in the history of the sport’s most dynamic franchise. And reading about Guidry’s own child-like admiration for guys like Roger Maris and the great Yogi Berra revealed the little boy inside one of the great left-handers in baseball history. Down here, Guidry’s highly regarded. In the Big Apple, even today, he’s a Yankee legend. “I thank God every day that when I’m up there, I’m still well-liked,” Guidry said in an interview earlier this week with me on KPEL 1420 AM. “It’s always fun to go back to New York right now. Guidry’s book goes a long way in explaining why. Click here for the Spotlight Feature on Ron, March, 2008. Click here for Ron's Athletic Network profile.